Anything done to remove a restriction in the intake and keep it a cold air intake system can't hurt. Some air filter oil is visible from on the filter gasket in this next picture. I drilled out the mount for a filter minder, which indicates when a filter is clogged. 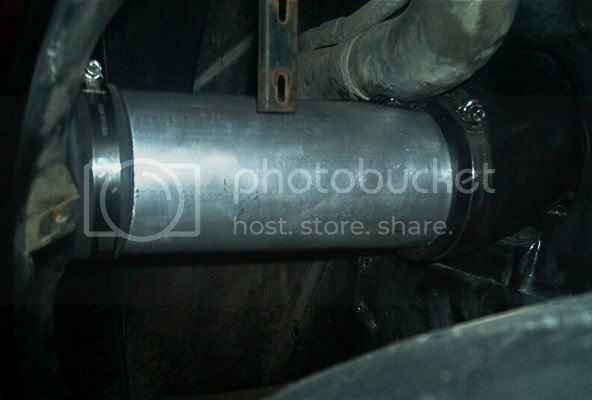 The removal of the intake muffler had increased intake sound on the driver’s side. However the new air box easily doubled this intake whistle. I have not driven long with this mod, and it is sitting for winter, but those few weeks before storage has shown the car seemed slightly more responsive to throttle movement. I believe the main improvement is the removal of the cross that caused a lot of turbulence, now improving airflow. This is on a stock V-6, however this change was done on the idea of keeping this style intake for a possible engine swap. Be sure to get the air temp sensor that comes with the filter can, as the hole needs to be plugged, and it plugs in directly to the stock fiero harness. I believe you would not have to move the evap canister if you make a different snorkel from the air box to the throttle body. If you dont want to go as far as I did you can cut just cut the cross in the lower bracket, and the cavalier air box will slide over the steel ring going up, and use the stock lower elbow. This way you only have to cut the cross out of both the cavalier air box and the lower mount. If going this route I would suggest using some silicone to ensure a good seal and that the air box does not move, although this would not be necessary. My way the air seal is good enough and the friction fit allows for removal without worrying about if it will shift at all. You could also use Rodney's intake base splitter which needs to be welded in, to me this cavalier air box was cheaper, and plastic so now we only need to worry about the lid rusting out. Nice fresh idea there Daniel. I think that what you did is a very clean looking system. + for you. I just did the 3" pvc thing the other day. Folks say that there is no power gain. So what? The intake sound is awesome. I had an officer (not pulled over, just drooling on my paint) actually mention the sound of the air intake. So, I believe that it was worth the effort to install it. I may have to copy your idea here soon. I got this idea from Fierosound who installed this style filter box, with an open top and scoop from above, so I cannot take full credit for this mod. I posted this for others to use if they desire, my main reason was not for more power, but future engine swap. I do not believe this filter box would be too much of a restriction for even the 3.8 sc engines (they had smaller filters and throttlebodies under 3") I did however want to free up the intake of any possible restriction and anything causing turbulance without sacrificing the ability to easily change the filter, so I did not want to hide the filter in the fenderwell. I also wanted to re-use the K&N filter that I already had without the need to weld anything. Here's part of the system for my 3800SC series III that I put together. It uses 3 1/2" diameter aluminum pipe that connects to a 3 1/2" 90* boat exhaust elbow that attaches to a 3 1/2" opening flange that was welded in at the bottom of the air filer housing. . Seems to provide plenty of air for my V6. As for the water separator delete or modification with 3" pipe that straightens out the air flow; this system will breath much better than the stock system where the air has to go around an obstruction and a bend. The question then is does the 2.8L need more flow? Probably not. That PVC tube looks to be about 2 inches? Now, if my calculations are correct, when this baby hits 88 MPH, your going to see some serious s***! If you give me torque and you take horsepower I'll kick your a$$ EVERY time. "believe the main improvement is the removal of the cross that caused a lot of turbulence, now improving airflow." Um, you cant improve airflow upstream of the air filter. it has to take a 90 degree turn through the air filter and then funnel through the outlet. Notice it measures in inches of water and maxes out at 2". this is 13.6 times more sensitive than inches of mercury 1 inch of mercury = 13.6 inches of water. 1 inch of water = 0.0339 bar pressure. I used one of those to prove that a K&N filter is useless in a fiero for more air flow, you need to get one if you want to verify that any of your changes actually made any improvement. I used 3" inside diameter abs into the bottom of the air filter box.